Warm up dinner with this Asian-inspired gluten-free stir fry. 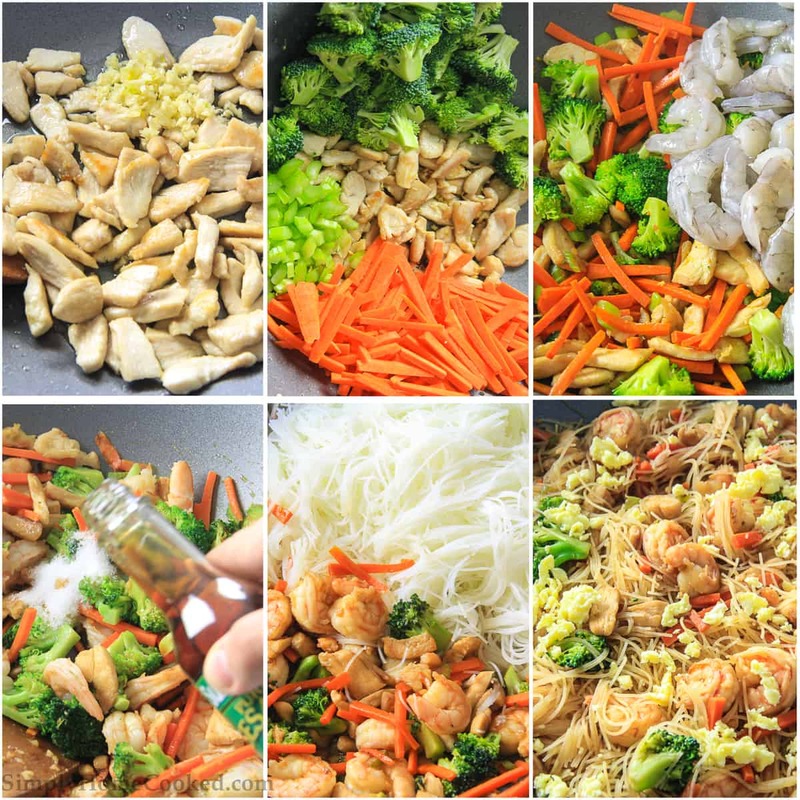 Discover how easy it is to cook with rice noodles and my favorite stir fry sauce. Make a complete meal by pairing it with my teriyaki grilled salmon. This recipe was originally posted January 2017, we’ve tweaked it a bit since then. This post may contain affiliate links. Read my disclosure policy here. I’m a sucker for anything stir-fried with soy sauce. Growing up, chow mein was always a favorite of mine. 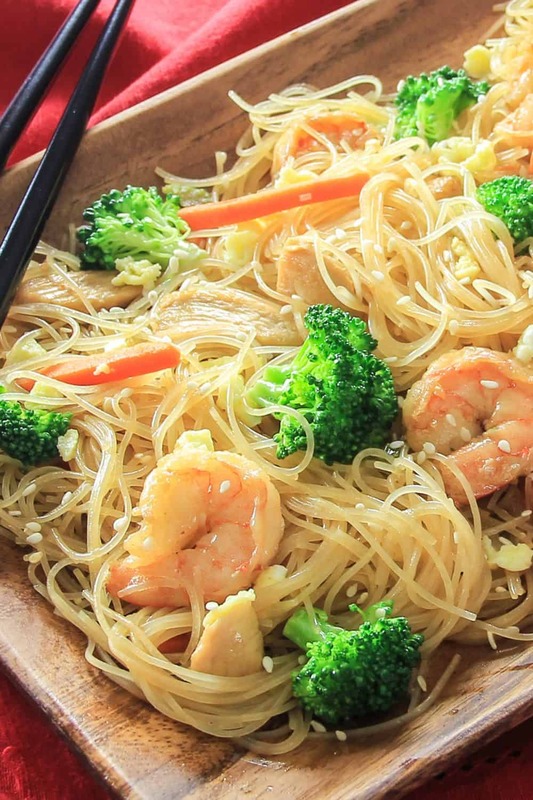 Unlike the yakisoba noodle recipe I posted earlier, this rice noodle stir fry is gluten-free. I must mention, just because it’s gluten-free, doesn’t mean it doesn’t taste as good. Some might say it even be better than traditional yakisoba noodles. It has just as much flavor yet leaves you feeling a little lighter than you would with yakisoba noodles. Fortunately, I don’t have a gluten intolerance, but I know plenty of people that do. This is a phenomenal substitute for the classic yakisoba noodle recipe. 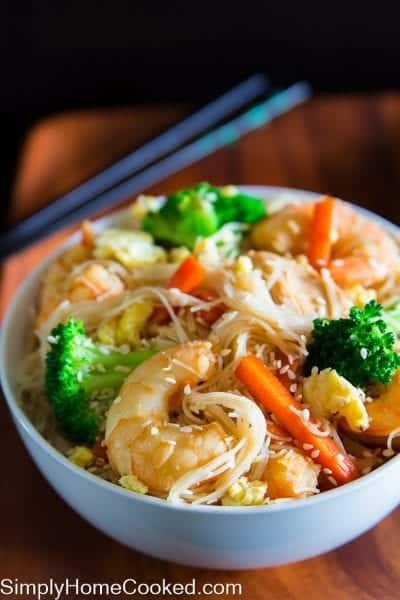 You’ll find the full details of how to make stir fry with rice noodles in the recipe at the bottom of the post. Here is a quick overview of the recipe, along with some pictures to help you out. Boil the rice noodles and then strain the water. Set them aside. Fry the chicken in a large wok with olive oil and garlic. Fry until the chicken is fully cooked. Add the celery, carrots, and broccoli florets. Add the shrimp to the wok and stir until they are fully cooked. Add the sugar, sesame oil, and low sodium soy sauce to the wok and stir to combine. Beat 2 eggs together and cook them in a separate pan. Once the eggs are cooked, mash them with a fork. Add the cooked rice noodles to the wok along with the scrambled eggs. Toss to combine. Garnish with sesame seeds. Cooking rice noodles is super simple. They only take 5 minutes. Let the water come to a rolling boil first. Then, place the rice noodles in the boiling water. Set the timer for 5 minutes. That’s it! After 5 minutes, drain the water. Done! Yes, rice noodles are naturally gluten-free. Always check the ingredients before you buy them, but most rice noodles are made of just two ingredients – rice flour, and water. Submerge the rice noodles in boiling water for about 5 minutes, then place them into a mesh strainer to drain all the water out. Set aside for later. In a large wok, heat olive oil on high heat and add the sliced chicken breast. Toss in the minced garlic and stir until the chicken is fully cooked. Add the celery, carrots, and broccoli florets. Stir on high heat for about 4 minutes or until the vegetables become tender. Add the shrimps to the wok and stir until they are fully cooked. Careful not to overcook them. Made these for dinner last night. I omitted the celery, doubled the egg and carrot. They were delicious!